Come Share Your Perspectives on Technologies for Learning: VIU Campus Input Sessions on the Student Digital Learning Experience! Digital technologies are an essential part of student learning. 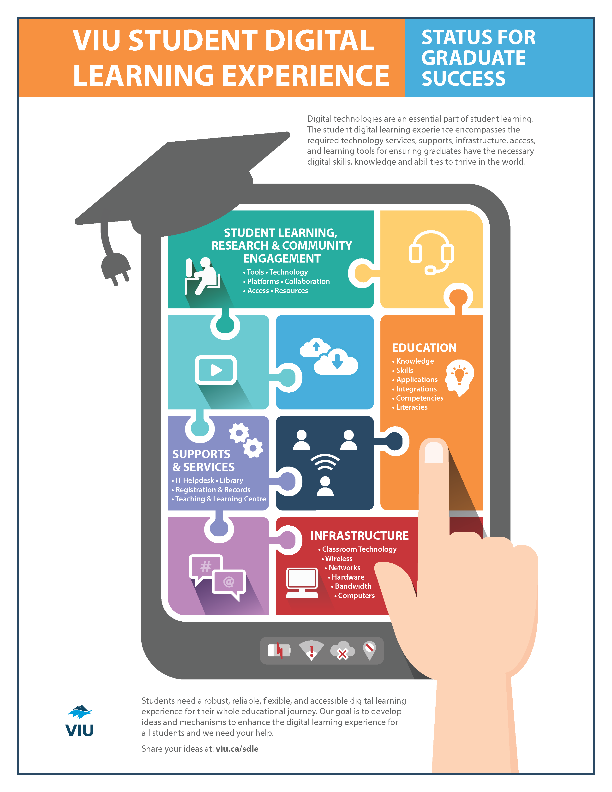 The student digital learning experience encompasses the required technology services, support, infrastructure, access, and learning tools for ensuring graduates have the necessary digital skills, knowledge and abilities to thrive in the world. Students need a robust, reliable, flexible, and accessible digital learning experience for their whole educational journey. Our goal is to develop ideas and mechanisms to enhance the digital learning experience for all VIU students and we need your help! Four VIU campus input sessions have been organized to hear from you! Click on the session you wish to attend to let us know you are coming through an Eventbrite registration page. If you are unable to attend a session and wish to contribute your thoughts on the topic, send an email to ciel@viu.ca and we’ll include in the feedback.